- Constants add any text to the renaming template. - Text variables add a text line that can be updated before every processing. - Counters (numerical and alphabetical) allow to numerate files. - Variables represent any limited part of the original file name or other string. - Extra variables refer to the metadata of files - EXIF (jpeg, tiff), ID3 (mp3), etc. - External variables call your own plugin program for additional processings. - Conditionals allow to deal with the most complicated cases. * In contrast to programming languages, all data types are defined visually and added to the template with just one click. * All your preferences can be saved to a preset to be used later with other files. Sophisticated Rename is an out of the common program for file batch renaming. RenameMan is a tool for renaming lots of files or folders quickly and easily. Renamer4Mac allows you to easily and quickly rename a large number of files. Rename all your files and folders, with a lot more options. 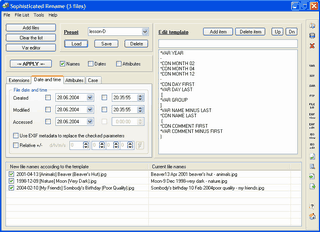 Files Renamer - Rename multiple files and folders at once. You can rename either each photo separately or all photos in a folder at once. Qweas is providing links to Acritum Sophisticated Rename 3.106 as a courtesy, and makes no representations regarding Acritum Sophisticated Rename or any other applications or any information related thereto. Any questions, complaints or claims regarding this application Acritum Sophisticated Rename 3.106 must be directed to the appropriate software vendor. You may click the publisher link of Acritum Sophisticated Rename on the top of this page to get more details about the vendor.